Youtube/Liberty Day InstituteBrett Talley, who was deemed ‘not qualified’ by the American Bar Association. 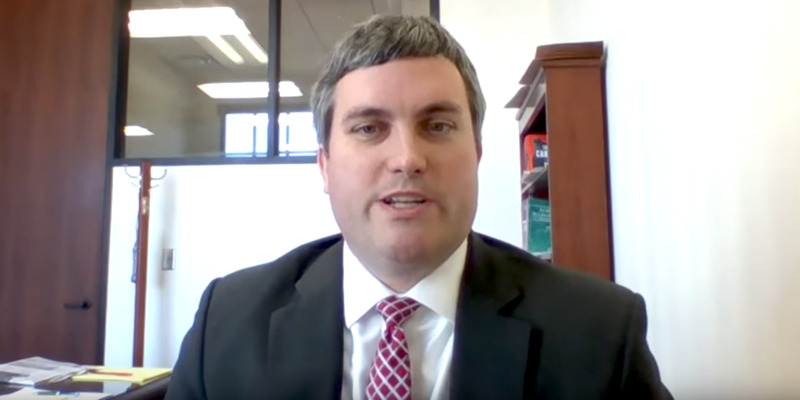 President Donald Trump’s judicial nominee for a district court judgeship in Alabama has withdrawn his nomination after controversy about his lack of experience and ties to a White House lawyer. Talley was deemed unanimously “not qualified” by the American Bar Association, and was formerly a ghost hunter and horror novel author with a cult following. Republicans like Sens. Chuck Grassley and John Kennedy have voiced their opposition to Talley’s nomination in recent days, even though Grassley initially voted in favour of him on the Senate Judiciary Committee, which he chairs. Brett Talley, one of President Donald Trump’s judicial nominees with ties to the White House who has never tried a case and is a former ghost hunter with a cult following, has voluntarily withdrawn himself from consideration for the position, Politico reported on Wednesday. Talley, who was one of two of Trump’s judicial nominees that the American Bar Association unanimously deemed “not qualified” for the position, “has offered to withdraw his nomination thus it will not be moving forward,” a White House official told Politico. Talley’s nomination has elicited controversy both inside and outside of Capitol Hill in recent weeks. While Talley’s nomination for a federal district court judgeship was approved by the Republican members of the Senate Judiciary Committee who voted along party lines last month, the committee’s chairman Republican Sen. Chuck Grassley told CNN he was no longer in favour of Trump moving forward with Talley’s nomination. “Moving so quickly makes it more likely that senators will be caught by surprise and end up having to vote for someone whose record they weren’t fully aware of,” she said. Last week, Republican Sen. John Kennedy stated that he would vote against Talley “in a heartbeat,” pre-empting Grassley announcing his own opposition. Talley is an attorney who has never before tried a court case, and revealed last month that he hadn’t disclosed his marriage to Ann Donaldson, a senior lawyer in the White House Counsel’s office, in his congressional filings. Donaldson was recently interviewed by special counsel Robert Mueller’s investigators about detailed notes she kept on her conversations with White House counsel Don McGahn, which included discussions the two had about the firing of former FBI Director James Comey, The New York Times reported. Talley wrote on his questionnaire to the Senate Judiciary Committee that he was part of the a ghost-hunting group called the Tuscaloosa Paranormal Research Group from 2009 to 2010. But Talley’s interest in ghosts goes even beyond his membership in the group, and he has built up a “cult following” as a horror writer, having written multiple books about paranormal activities.